Career as a player - Started his playing career with Mosta FC at the age of 7. He played with Mosta FC until the age of 21 where he also played in the 1st Division. He then moved to Futsal and played for 7 seasons with Scandals FC with whom he won the national Futsal league and also participated in the UEFA Futsal Cup held in Helsinki, Finland in 2007. He then played with Aluserv Futsal Club for a year before moving to Luxol Amazon Cinco Futsal Club for a further two seasons. JeanBert played with San Gwann Futsal Club during season 2013/14 with whom he reached the final 4 playoffs in the Futsal Premier division. In season 2014/15 JeanBert played and was the captain at Lija Athletic Futsal Club who were declared Champions of the 1st division. During season 2015/16 JeanBert played for Swieqi Futsal Club, a team that finished 5th in the top division, making it to the Elite Group but missing out on the final playoffs. 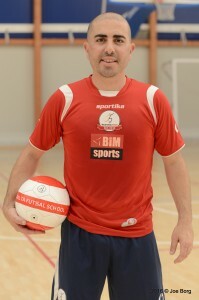 JeanBert also formed part of the Malta Futsal National Team for 5 years, ending his term in December 2010. In September 2016, JeanBert decided to retire, hence ending his long Futsal career after 17 years.